Polar mesospheric clouds—also known as noctilucent or “night shining” clouds—form between 76 to 85 kilometers (47 to 53 miles) above the Earth’s surface, near the boundary of the mesosphere and thermosphere, a region known as the mesopause. At these altitudes, water vapor can freeze into clouds of ice crystals. When the Sun is below the horizon and the ground is in darkness, these high clouds may still be illuminated, lending them their ethereal, “night shining” qualities. Polar mesospheric clouds have been observed from all human vantage points in both the Northern and Southern Hemispheres—from the surface, in aircraft, and from the International Space Station (ISS) —and tend to be most visible during the late spring and early summer. Some atmospheric scientists seek to understand their mechanisms of formation, while others have identified them as potential indicators of atmospheric changes resulting from increases in greenhouse gas concentrations. This astronaut photograph was taken when the ISS was over the Pacific Ocean south of French Polynesia. While most polar mesospheric cloud images are taken from the ISS with relatively short focal length lenses (to maximize the field of view), this image was taken with a long lens (400 mm) allowing for additional detail of the cloud forms. 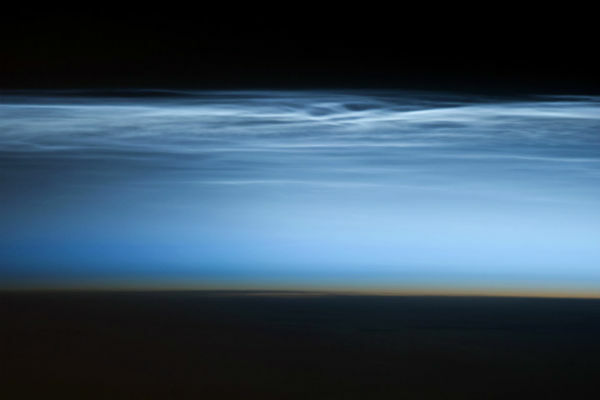 Below the brightly-lit noctilucent clouds, across the center of the image, the pale orange band is the stratosphere.